In the near future, humans live in isolation and only interact through robotic bodies that serve as surrogates. 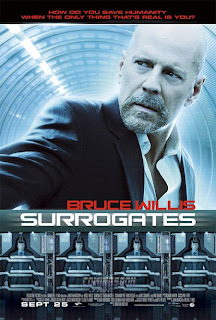 When several humans are murdered when their surrogates are destroyed, a cop (Bruce Willis) investigates the crimes through his own surrogate. After a near fatal encounter, the cop's surrogate is destroyed and forces him to bring his human form out of isolation and unravel a conspiracy behind the crimes.